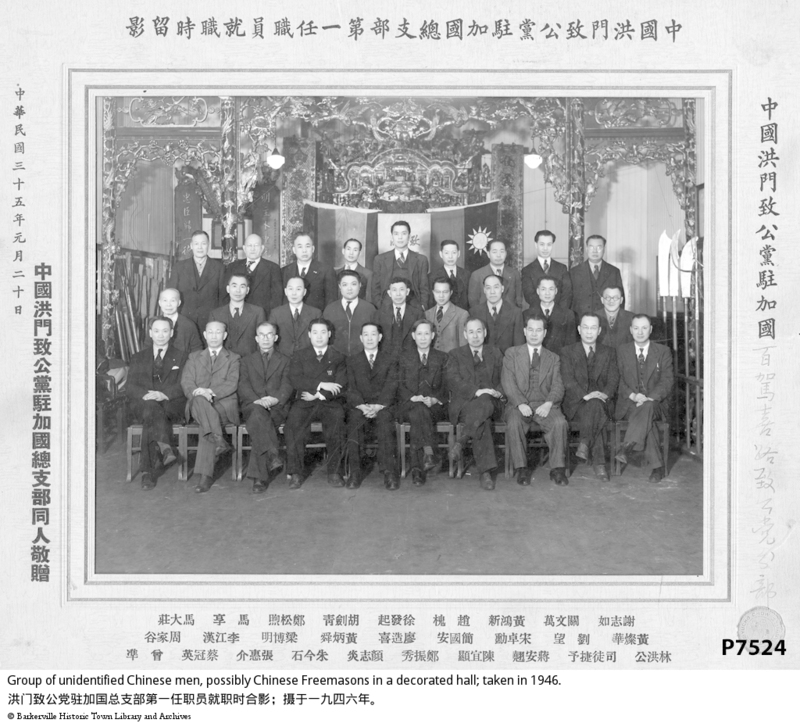 ItemBARK_1985.0005.0001 - Group of unidentified Chinese men, possibly Chinese Freemasons in a decorated hall; taken in 1946. Item BARK_1985.0005.0001 - Group of unidentified Chinese men, possibly Chinese Freemasons in a decorated hall; taken in 1946. Three rows of oriental gentlemen who are shown sitting and standing within a large room. The artifact has been affixed to a rectangular shaped beige coloured segment of cardboard, and upon this in turn oriental characters appear in both black ink and black pencil. On the back of the artifact, "VANCOUVER sometime after 1930's appears in black hand written pencil. Below the photo are the names of the persons in the photo.